Antonio L DiBrita, Age 85. Beloved husband of Giovanna (nee Minelli). Loving father of Gina (Joseph) Samperi and Johnny (Angela) DiBrita. Beloved son the late Marie (nee Coduti) and Giovanni DiBrita and son in law of the late Carmela and Biagio Minelli. 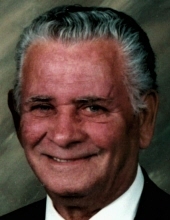 Cherished grandfather of Joseph Anthony, Gabriella Carmella, Anthony Rosario, Giovanni Antonio and Aviana Francesca. Dear brother of Lucia (late Michele) Calzolaio and Rocco (Anna) DiBrita and brother in law of Maria (late Antonio) Coduti. Fond uncle of many. Visitation Tuesday Feb. 5 from 3 to 9:00 p.m. at Cumberland Chapels, 8300 W. Lawrence Ave., Norridge. Funeral Wednesday 8:30 a.m. from the funeral home and will then proceed to Divine Savior Church for Mass at 9:30 a.m. Entombment All Saints Mausoleum. To send flowers or a remembrance gift to the family of Antonio L. DiBrita, please visit our Tribute Store. "Email Address" would like to share the life celebration of Antonio L. DiBrita. Click on the "link" to go to share a favorite memory or leave a condolence message for the family.